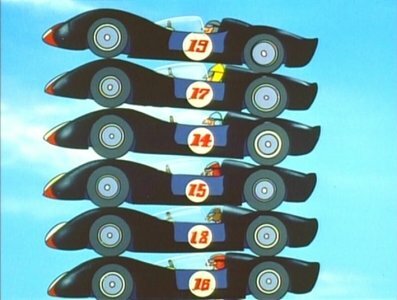 The only recurring villains to bedevil Speed Racer were the members of the Car Acrobatic Team, who also had the distinction of appearing in the sole three-part story of the series, “The Most Dangerous Race.” Each driver sported a uniform marked with a letter of the alphabet, and their cars deployed tiny wings to aid them in performing wild, mid-air pirouettes. Captain Terror hurried to the dentist for a deep gum cleaning. 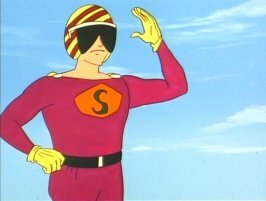 Aside from Cap’n Z (affectionately known as “Ol’ Smiley”), the other Car Acrobat of note was Snake Oiler, who was assigned the letter “S” because he loved sandwiches. He was kind of a tool. 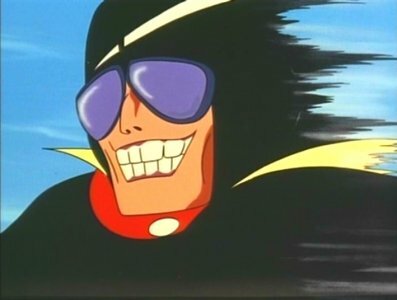 Speed insisted upon entering the Alpine Race despite the warnings of Racer X, and indeed found it to be a most dangerous race. The grueling, three-day course traversed icy tunnels and 1,000 foot drops; many drivers were killed attempting to jump Yawning Chasm Pass. Speed himself failed to reach the other side, and was temporarily blinded in the crash. Somehow the Mach 5 was still drivable, and Speed located it by the smell of its oil. Racer X then showed up, determined to let Speed finish the race without realizing he was being helped. Now, any reasonable people might’ve realized the futility of attempting to drive over a treacherous mountain course while blind, but reason was in short supply at the Racer household. 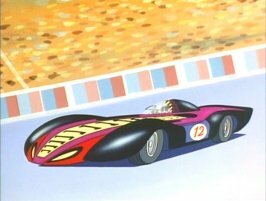 Racer X’s solution: to drive his own car and allow Speed to follow in the Mach 5 by listening for the distinctive sound of the Shooting Star’s engine. Surprisingly, this didn’t quite work. 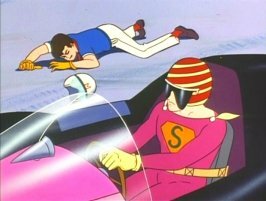 When Speed became stuck in the mud, the Masked Racer faked a crash and pretended to be injured so that he could provide the eyes while Speed provided the legs. Amazingly, the pair managed to catch up to the sole remaining racer, Snake Oiler. Unknown to him, Snake’s car had sprung a bad oil leak, and he ignored the warnings of Speed and Racer X. And by now you should know what that meant. Snake didn’t die, but was badly injured and carried off the course by Captain Terror, who vowed revenge. 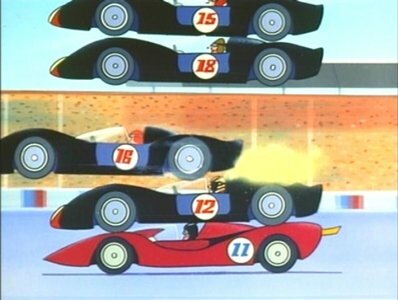 That didn’t occur until the next-to-last episode of the series, when the surviving Car Acrobats (who didn’t appear to include Oiler) challenged Speed to a final race. 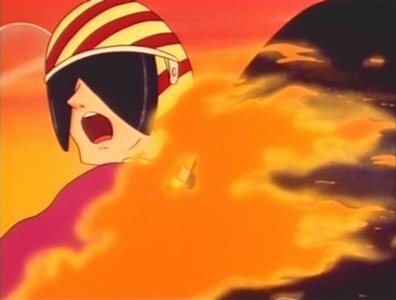 However, it turned out that all of them were being set up by International Spies, Incorporated, who planned to kill both Speed and Racer X by wiring the Car Acrobatic Team’s vehicles to explode. In the end, Speed teamed up with Captain Terror and blew up the spies’ headquarters by parking the rigged cars nearby. Snake Oiler is featured prominently in both the merchandising and advertising for the upcoming film. I’m not certain whether the rest of his team will join him, but it looks like pretty much everyone is a car acrobat in this one.